Despite this, the agency found that emails on her private servers contained classified information. 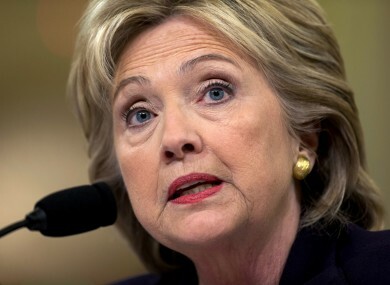 Clinton has been criticized for using a private email server while US Secretary of State. THE FBI HAS said that 110 emails sent or received on Hillary Clinton’s private email server contained classified information. The emails were sent while Clinton was US Secretary of State but the FBI has said that her actions were “extremely careless” rather than criminal. In a press conference this afternoon, the FBI’s Director James Comey said that he would not be recommending criminal charges against the Democratic presidential candidate. Despite this, Comey said that “hostile actors” may have gained access to her email account. The US Justice Department has been looking into whether anyone mishandled classified information that flowed through Clinton’s email server. Attorney General Loretta Lynch said last week that she would accept the recommendations of the FBI director and of career prosecutors, meaning that Comey’s decision almost certainly brings the legal part of the issue to a close. Clinton’s personal email server, which she relied on exclusively for government and personal business, has dogged her campaign since The Associated Press revealed its existence in March 2015. She has repeatedly said that no email she sent or received was marked classified, but the US Justice Department began investigating the controversy last summer. BREAKING: FBI Director: Agency won't recommend criminal charges in Hillary Clinton email investigation. The announcement that no criminal charges are to be recommended removes a serious cloud over her campaign but the findings against her and her staff will likely be repeatedly used against her by Donald Trump and other opponents in the upcoming months. Trump tweeted a reaction to the news within minutes of the announcement, saying that she had placed the country’s national security at risk. Email “The FBI will NOT push for criminal charges against Hillary Clinton”. Feedback on “The FBI will NOT push for criminal charges against Hillary Clinton”.